In our PodScanning column, we look at the latest podcasts and podcasting news in public media. Send tips to tyler@current.org. WGBH in Boston and The GroundTruth Project, a nonprofit that reports on social justice issues, have announced a new podcast, GroundTruth, that aims to look beyond the headlines of global news stories. The biweekly podcast, announced Sept. 11, will run roughly 20 minutes per episode. 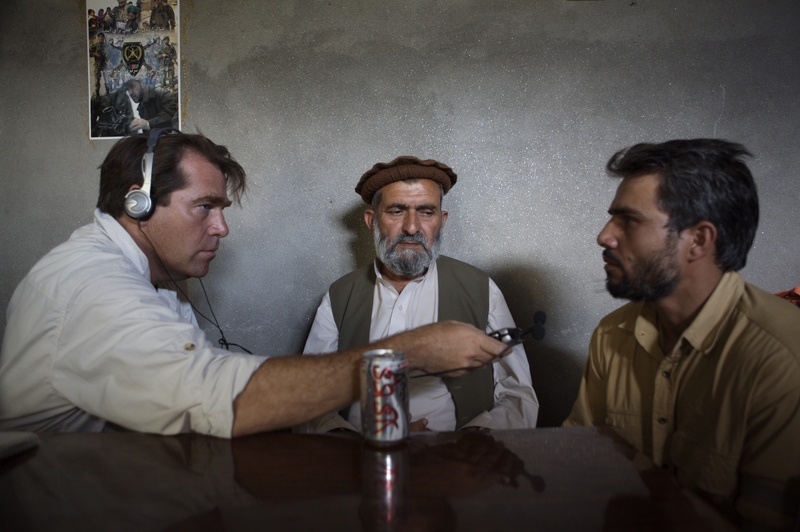 Season one of the podcast will consist of six episodes expanding on “Foreverstan: Afghanistan and The Road to Ending America’s Longest War,” a three-part series resulting from a collaboration between WGBH and The GroundTruth Project. Topics explored will include the origin of the war in Afghanistan and its impact on the country’s people. Charles Sennott, founder and executive director of The GroundTruth Project and co-founder of GlobalPost, will host the new show. GroundTruth and WGBH are co-funding the first season. GroundTruth is the station’s fifth podcast, along with Security Mom, Innovation Hub, The Scrum and a weekly podcast featuring the station’s favorite stories from its weekday afternoon program Boston Public Radio. KQED in San Francisco launched a four-episode podcast this month after holding an internal competition to develop podcast ideas. With short episodes featuring first-person stories, Love in the Digital Age looks at how digital technology affects human relationships. The first episode tells the story of a married couple separated by immigration policies and geographical boundaries, yet they stay in communication through technology. The show is hosted by KQED reporter Rachael Myrow and produced by the station’s Polly Stryker. According to Myrow, the idea for the show arose when the station put out a call for departments within KQED to come up with podcast ideas. Of the 19 proposals, involving 55 staffers across about 12 departments, six were chosen as semifinalists. Love in the Digital Age didn’t win the competition — that went to another podcast yet to be launched. But some of the semifinalists are living on. “In the end, the projects were so compelling that a lot of managers said, ‘Let me find someplace in the budget to support this podcast,’” Myrow said. Myrow is excited to have released her first podcast episodes and said the process was also valuable for the organization. “It was incredibly energizing and incredibly exciting,” she said, adding that staffers regularly met at local coffee shops and pubs to discuss possible ideas. “We’re podcast fans, so the idea to get a chance to do one yourself is exciting,” she said. Because this is an experiment — “we’re dipping our collective toes” into podcasting, Myrow said — the future of the podcast isn’t certain. The station will evaluate the response from the first four episodes — which will also air on KQED radio — and go from there. “I would love to imagine there will be a massive upwelling of public interest,” Myrow said. “If that happens, I would be happy to step up and deliver” more episodes, she said. And a new podcast from WNYC follows Columbia University’s football team as it enters the season on a 21-game losing streak. The first episode of The Season was released Sept. 17. Ilya Marritz, a WNYC business reporter, hosts the 11-episode podcast, which follows the team over its 10-game, 10-week season. The idea came from WNYC’s v.p. of news Jim Schachter, who “heard what was happening with the CU football program and thought, what if we could get access and show our listeners organizational change at work, show them what it’s really like for a team with a poor record to try to make a turnaround?” according to a WNYC spokesperson. Bonus: WNYC is launching a new recap podcast, Empire Afterparty, about the television show Empire. NPR’s new podcast, which rose near the top of the iTunes podcast charts with only two preview clips, released its first episode Tuesday. This American Life hosted an “audio hackathon” over the weekend. Here are the ideas that were developed (click on “projects”). 99% Invisible opened its full archives on iTunes, monetized with preroll ads on all episodes over eight weeks old. A Q&A with Midroll Media’s vice president of business development. The would-be producers of The City and Gaydio will get production help from the New York City station.